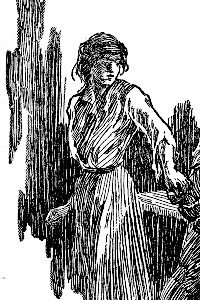 Jane Porter (later Jane Clayton, Lady Greystoke) is a major fictional character in Edgar Rice Burroughs's series of Tarzan novels and in adaptations of the saga to other media, particularly film. Jane, an American from Baltimore, Maryland, is the daughter of professor Archimedes Q. Porter. She becomes the love interest and later the wife of Tarzan, and subsequently the mother of their son Korak. She develops over the course of the series from a conventional damsel in distress, who must be rescued from various perils, to an educated, competent and capable adventuress in her own right, fully capable of defending herself and surviving on her own in the jungles of Africa. the nineteenth, Tarzan's Quest (1936). Jane also appeared in a minor role in the non-Tarzan novel The Eternal Lover (1925), the events of which take place chronologically between The Return of Tarzan and The Beasts of Tarzan. In addition, Porter is the narrator-protagonist in Jane: The Woman Who Loved Tarzan by Robin Maxwell, a 2011 novel authorized by Edgar Rice Burroughs, Inc. to commemorate the centennial celebration of Tarzan. Maxwell's novel is a free adaptation of the original story, contradicting it on numerous points of the story. Early Tarzan films portrayed Jane Porter and (occasionally) her father faithfully to the portrayal in the novels. The 1932 sound film Tarzan the Ape Man and its sequels changed the character's name to Jane Parker, portraying her as English rather than American and making her and Tarzan the adoptive parents of an orphan they named "Boy". In addition, the name of Jane's father in the first film is James Parker. Remakes of the 1932 film, (Tarzan, the Ape Man (1959) and Tarzan, the Ape Man (1981)) reprised this portrayal as well as that of her father. Maureen O'Sullivan, who portrayed Jane Parker opposite Johnny Weissmuller in the 1932 film and its first few sequels, was the most famous screen Jane. In more recent Tarzan films, starting with Greystoke: The Legend of Tarzan, Lord of the Apes (1984), the character is once again Jane Porter, and her father Archimedes Q. Porter, and both once again Americans (with the exception of Disney's 1999 animated Tarzan, which again represents both as English). Three Tarzan films presented female leads who became the partner of Tarzan, but who were not named Jane, for one reason or another. Tarzan the Mighty (1928), starring Frank Merrill. Natalie Kingston portrays Mary Trevor, who becomes Tarzan's mate at film's end. A year later Kingston portrayed Jane to Merrill's Tarzan in Tarzan the Tiger. Tarzan the Fearless (1933), starring Buster Crabbe. Jacqueline Wells portrays Mary Brooks, who becomes Tarzan's mate at film's end. Tarzan's Revenge (1938), starring Glenn Morris. Eleanor Holm portrays Eleanor Reed, who becomes Tarzan's mate at film's end. Producer Sol Lesser nixed calling the character Jane as he felt Miss Holm was so popular for her swimming exploits that audiences would not accept her playing a character not named Eleanor. Tarzan and the Brown Prince (1972), starring Steve Sipek. Kitty Swan portrays Irula, his mate, basically similar to Jane. During the filming of a torture scene, Sipek and Swan were tied to stakes when gasoline-soaked leaves ignited and both were seriously burned. The Jane character has appeared sporadically in the seven (to date) television series featuring Tarzan, occasionally in offbeat portrayals when she does appear. She was entirely omitted in NBC's television series, Tarzan (1966–68). In the Filmation animated series Tarzan, Lord of the Jungle (1976–80) she only appeared once, in the episode "Tarzan and Jane," in which she and her father were part of an archaeological expedition looking for the lost city of Cowloon; she was voiced by Linda Gary in that episode. In the made-for-TV movie Tarzan in Manhattan (1989) the character was reimagined as a New York cab driver, played by Kim Crosby, and in the French-Canadian-Mexican series Tarzán (1991–94) as a French ecologist, played by Lydie Denier. Jane was again absent from Tarzan: The Epic Adventures (1996–97), although Lydie Denier returned in the role of Olga de Coude; Jane herself was slated to appear in the unproduced second season, with Julie St. Claire cast in the role. Olivia d'Abo took the role in the Disney animated series The Legend of Tarzan (2000-2003), a follow-up to Disney's animated Tarzan film and its direct-to-video sequel Tarzan & Jane (2002). The 2003 series Tarzan, set like Tarzan in Manhattan in New York City, casts Sarah Wayne Callies as NYPD detective Jane Porter. In the CGI 2017 Netflix series Tarzan and Jane, Jane Porter is a teenage big city girl who becomes friends with a teenage Tarzan.